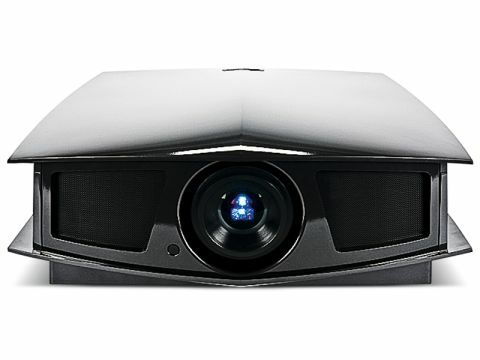 French brand Cineversum and its own LCoS (Liquid Crystal on Silicon) projectors have a much lower profile than JVC and Sony, who are well-known for their LCoS projector technology – found in their D-ILA and SXRD-branded models, respectively. Perhaps that explains the curious, look-at-me styling of its BlackWing range, which has come courtesy of designer Antoine Béon – who has also worked with speaker brand Focal on some of its more outlandish-looking cabinets. Put it this way: it's not often a projector gets appreciative wolf-whistles from the goggled-eyed geeks in the HCC Tech Labs. The question is, though, how does Cineversum's souped-up model compare to the PJs from the big Japanese brands, particularly the Sony VPL-VW85 reviewed elsewhere in this issue? The big and beautiful BlackWing One employs three 1080p 0.7in LCoS panels. Yet this micro-display technology is only part of the PJ story – also key is the lens system. For the BlackWing One, Cineversum has specified its Ultimate Reference lens, a full-glass design with a 1.5-2.2:1 throw ratio. Compared to some projectors, the zoom is rather restricted – 1.5x. At a projection distance of 4m, I couldn't fill a 120in (diagonal) screen even with the lens at its end-stop. A key point, if your home cinema is smallish, but if room size is no object, you'll be happy that an 8.5m projection distance will reward you with a gargantuan 250in 16:9 picture. Focusing and zoom on the BlackWing One are not motorised, but adjusted with concentric rings around the lens, and both are beautifully precise. Lens shift is also offered (+/- 60% vertical, +/- 30% horizontal), although this proved fiddly with the projector placed on my test platform as the relevant dials are tucked into the base. Prospective buyers should note that a 2.35:1 anamorphic kit – the 'Theatre Concept' – is available. If most of your movies are in this format, this optional accessory is worth investigating. It's motorised, and can thus be easily switched into action. With this in mind, two 12V triggers are featured. One can activate masking when a 2.35:1 film is shown on a 16:9 screen (or vice versa), while the other ensures that the outboard lens is enabled. If you're placing the BlackWing One on a table then you'll appreciate the adjustable feet, which let you compensate for wonky surfaces and line the picture up with the screen. Ceiling mounting (upside down) and rear-projection (mirror image) are catered for in the setup menus. Digital keystone correction adjustment is also available. Cineversum has paid attention to another key element of projector design – video processing. The BlackWing uses HQV tech, which you'll find embedded in high-end kit from other manufacturers including Toshiba, Onkyo, Mitsubishi and Samsung. Furthermore, each BlackWing One projector is individually calibrated by one of Cineversum's engineers. The onboard scaler gives you two HDMI (v1.3) inputs, both of which will accept 1080p24. The component will go up to 1080i, whilst for legacy SD sources you get composite and S-video. Large-screen PC gaming and home-theatre PC users can make use of a D-Sub/VGA input. Inputs can be selected via the backlit remote, or a control panel recessed into the rear – menu access is also possible from here. The LCoS chippery, lens system, video processing and calibration all work together to deliver – or so it's claimed – a contrast ratio of 15,000:1, coupled with a 1,200 Lumen brightness. I'm also told by Cineversum that the picture quality is 'very natural' and 'CRT-like'. Well, it's good to see a manufacturer recognising that a derided 20th century technology still has visual properties worth aspiring to. Lens-shift apart, the BlackWing One gave me no setup hassles. An onboard pattern generator eases screen line-up and focusing/zoom. The comprehensive array of adjustments on offer will appeal to serious enthusiasts and the ISF calibration brigade alike. Independently-memorable for each input, they include three 'user' sets of colour-temperature adjustment (gain and bias for all three channels) and gamma curve, noise reduction, a blue-only mode (for display calibration), black level, white level and overscan – as well as the usual aspect ratio, contrast, brightness, saturation and hue. The lens aperture can also be adjusted in 10 per cent steps, improving contrast and black level at the loss of brightness. Particularly welcome is an information panel that tells you about the currently selected source (refresh rate, resolution and so on). Overall, the BlackWing One deals out some very credible imagery. Whether fed with standard-def interlaced video or 1080p/24 Blu-ray, movement is silky-smooth and noticeably superior to bigscreen LCD and plasma displays – such are the benefits of the LCoS microdisplay technology. Then there's the colour reproduction, which can be stunning in its sheer depth. Detail resolution is on the whole impressive. Boot up the Transformers Blu-ray, and you can almost read the computer displays in a wide-shot of the Pentagon Ops room. With the BlackWing One, that movie's intricate Oscar-nominated effects-work dazzles, too. Now you can truly appreciate the care that the artists put into the design of those Autobots and Decepticons. DVDs, fed in at 576i and upscaled by the projector, put up a fight, although the drop in detail relative to hi-def is obvious. Despite this, even detail-rich movies like The League of Extraordinary Gentlemen are more than acceptable given the format's limitations – the sheen and patterning of the Nautilus comes across very well, while the film's night-time recreations of late-Victorian London, Paris, and Venice, highlights the projector's ability to reveal what's in the shadows. On the downside, the BlackWing One's black level is a tad disappointing – decent plasma screens usually yield a far closer approximation, as does its much-vaunted rival, the Sony VPL-VW85. (In fact, it's in this aspect where the Cineversum disappointed in our Tech Labs, delivering a very old-fashioned and unspectacular looking contrast measurement of just 2,668:1). Turning the iris down to its minimum 10 per cent setting and switching the lamp to its 'economic' (low power) mode does help considerably, but annoyingly, the reduction in brightness makes viewing in a light-proofed room mandatory. Also worth pointing out are the exceptionally low noise levels – visual noise, that is. The whirring of the cooling fan, despite Cineversum's claims, can be distracting in a smaller room after the PJ has been running a while. That said, the low-power lamp mode tames the latter. Black reproduction apart, the BlackWing One delivers the goods in picture quality. The range of features and adjustments is also impressive, while its take on LCoS projector casework design is not without designer charm. It makes for an interesting alternative to the immediate competition from Sony and JVC, and the option of a Cineversum-branded anamorphic lens may tip it in your favour.